Ever since plans for a full-blown Avengers movie were revealed, fans of comic books and the movies they inspire have been ticking off a laundry list of hurdles that needed to be cleared in order to make the multi-character adventure a reality. The concept was so far-fetched back when Samuel L. Jackson’s Nick Fury first graced a post-credit sequence at the end of Jon Favreau’s Iron Man that most of us were just geeked to see some form of Marvel superhero crossover on the silver screen. (Prior to that, the only thing that ever happened at the end of a credit sequence was a really bad blooper.) Then Robert Downey Jr. strutted onto the scene to trade one-liners with William Hurt at the end of Louis Leterrier’s underrated The Incredible Hulk, and all of a sudden the possibility of Marvel actually pulling off this Avengers initiative edged closer to reality. Now we’re on the precipice of seeing Earth’s mightiest heroes assemble for a major motion picture. But something extraordinary happened on the way to Summer 2012, when Joss Whedon’s Avengers will blast its way through theaters. Instead of mailing in a half-hearted origin story that felt like a placeholder for a future adventure (yes, Thor, I’m looking at you), Joe Johnston went ahead and turned his Captain America film into a rousing period thriller that expands on the Marvel mythology while also working as a standalone summer blockbuster capable of entertaining audience members who don’t know a thing about Steve Rogers or his super soldier serum prior to purchasing a ticket to The First Avenger. Here are four reasons why we believe Johnston’s Captain America: The First Avenger is the Marvel movie audiences have been waiting for. Antagonists have not been a strong suit for the Marvel movies to date. Alfred Molina might have nailed Doc Ock in Sam Raimi’s second Spider-Man movies, but I had serious issues with the portrayal of such classic villains as Green Goblin and Sandman. Don’t even mention Topher Grace as Venom or I’ll find you and punch you in the face. Favreau’s Iron Man movies, in particular, suffered from weak adversaries. In both films, Tony Stark ended up fighting robotic clones, mirror images of his Iron Man character. And while Mickey Rourke cut a memorable swath as Whiplash, he was easily defeated in not one but two quick battles. Bring on Mandarin, already! 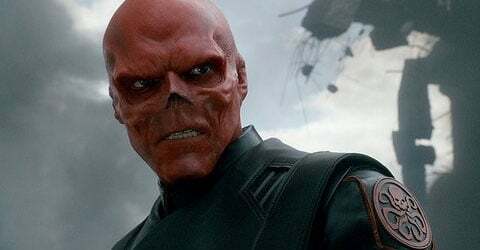 And now that we’ve seen the fantastic Hugo Weaving as Red Skull in Johnston’s Cap, it’s mildly disappointing to hear that Whedon’s going with Loki for his Avengers villain. 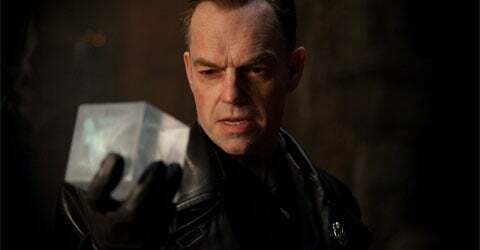 Not that this should come as a surprise to anyone, but Weaving is sufficiently sinister, confident, imposing and egomaniacal as Johann Schmidt, a Nazi general with an interest in the occult who was badly damaged (yet physically heightened) by the same program that boosts Rogers’ Captain America. He’s a memorable villain portrayed by a memorable actor, and I hope our hero gets to face this adversary a few more times in subsequent sequels. The minute we saw Downey in the back seat of the Army transport sipping a Scotch and playfully bantering with the soldiers, it was evident Favreau had made an inspired choice to play the arrogant billionaire turned superhero. As mentioned in virtually every review, Downey brought a bit of his own baggage to the Stark role, and it added layers that helped the character soar. 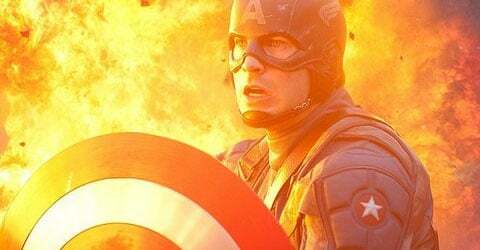 The opposite happens with Evans as he assumes the heroic role of Cap. The actor’s trademark sarcasm and smarmy ego – which worked so well for his turn as the Human Torch in Tim Story’s Fantastic Four films – are gone. And they’re never missed. In their place, Evans taps beautifully into the determination, the doggedness, the fearlessness that defines Captain America. Watch his ceaseless pursuit of a Hydra spy through Brooklyn’s streets (and into its waters) and you’ll understand that Evans, with Johnston’s help, has cracked Cap’s code of honor. Evans stands atop a tremendous ensemble of character actors that includes Stanley Tucci, Tommy Lee Jones, Hayley Atwell and Toby Jones. Now I can’t wait to see him mix it up with Downey in what’s bound to be a combustion of chemistry for Whedon’s Avengers. Now that all of the pieces to the Marvel universe have been laid out on screen, we can chuckle as we see the dots being connected by Johnston and his directing peers. It’s impossible to watch the World Exposition of Tomorrow on screen in Captain America and not think back to Stark’s own expo in Iron Man 2. There’s even an exhibit for Modern Marvels (har har) where Howard Stark (Dominic Cooper) introduces a flying car … one that probably uses a lot of the same technology that will help his son fly decades later. Cap readers will love getting to see classic comic characters like “Bucky” Barnes (Sebastian Stan) and “Dum Dum” Dugan (Neal McDonough) leap from the page to the screen. Johnston also nails the metallic clang we hear every time Cap connects with a villains skull. It’s glorious. I haven’t geeked out over a sound in a Marvel superhero since Hugh Jackman first unsheathed Wolverine’s claws to the instantly recognizable “Snikt!” in Bryan Singer’s first X-Men movie. So cool. Of course, Captain America has the requisite Stan Lee cameo. And late in the film, there’s the Sam Jackson cameo to help tie all the threads together. At this stage, I think I’m more excited to see Jackson’s Fury than I am to see Stan “The Man,” but that’s just because the novelty of Lee’s drop-ins has worn off. That's right. Musical numbers. Johnston dares to drop a memorable one in the middle of Captain America, and that actually makes sense. 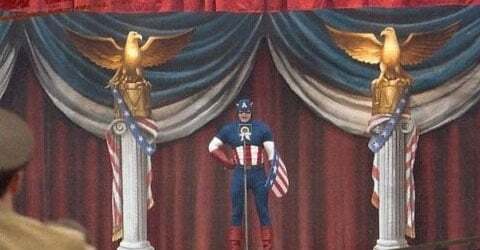 Prior to taking his fight to the battlefield, Rogers is used by our government as a spokesman for war bonds, so Cap sings and dances with a kick line of beautiful dancers as they perform a show-stopping, patriotic musical number that culminates with the star-spangled superhero delivering a roundhouse punch to Adolf Hitler himself. It’s outstanding, and not just for the pure kitsch value of the sequence. The music’s good. It could hold its own on the Great White Way. Hey Bono and The Edge. Tell your Spider-Man: Turn Off The Dark show to move over. There’s another Marvel hero with some musical ability on display!